For a bank as large as HDFC, the reliability and speed of data transmission are of major importance. Both the bank and its customers require error-free connectivity around the clock. And that is something provided by the network solution from R&M. Project: IT cabling of the main office and branches, installation projects over several years. 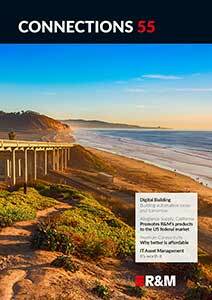 Application: Local data networks (LAN), structured office and building cabling with Cat. 5e and Cat. 6. The IT revolution that India has witnessed over the last two decades helped with the digitalization of the Indian banking system. The widespread adoption of online banking and mobile banking is increasing all the time. For a bank as large as HDFC, the reliability and speed of data transmission are of major importance. Both the bank and its customers require error-free connectivity around the clock. The demands made of LAN infrastructures by the private bank based in Mumbai were correspondingly high. Robust cabling and stable network connections were envisaged for all sites. The HDFC Bank relies on tried-and-tested copper platforms from the R&Mfreenet cabling program. The bank has found them simple to install and easy to upgrade. The platforms also offer the desired operational reliability and high availability. 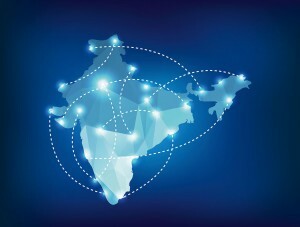 The bank is now using network components by R&M in more than 400 branches throughout India. Top-quality Cat. 5e cables and components usually form the basis for connecting workstations and terminals. In the HDFC offices in Mumbai and Pune, 10 GbE-capable Cat. 6 connection modules, Cat. 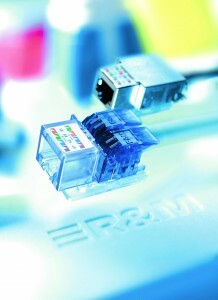 6 patch cords and 24-port patch panels from R&M are also in use. The management of the HDFC Bank were won over by the quality and reliability of R&M’s LAN cabling solutions. The networks in the main office and the branches work interruption-free. And this means the bank never has to worry about downtime. It is always available to its online customers. HDFC will continue to use R&M solutions in future projects.